My personal defense of choice is an odd man front… I have used it in the past, and it is what I know best, to me a 3 man DL with 8 stand up players puts a lot of speed on the field, allows you to drop 8 in coverage easily, and lets you bring pressure from anywhere. I am a big believer in a 3 man line because you can line them up and single gap them, you can 2 gap them, or you can do my favorite, and slant them. I love slanting (especially when all you have is wrestler builds, no big strong 300 lb kids to plug gaps up) because you can really create problems for the OL by messing with their rules and confusing them. As an OL coach I would much rather face a DL that plays the gap they line up in, compared to one who is constantly slanting on me. 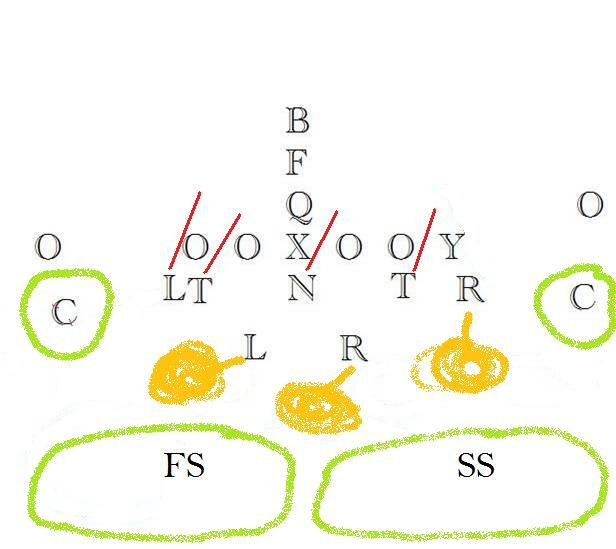 Now many people debate these 2 defenses, but I say stop looking at # – # and equating that to some master scheme and just look at what you are in, if a 3-4 or a 3-5 is your front, then that front is determined by the coverage you choose to run ( see my earlier post on coverage determining front). I do not see myself as a 3-4 guy, or a 3-5 guy… I am both. When I want to run a 2 high coverage, my front becomes a 3-4, when I walk my SS down to play 1 or 3, now I have made my front into a 3-5. I have to admit that the more I learn about 2 high coverages the more I like it, but I have traditionally been a 1 high coach, and based out of cover 1 and 3. I still feel more comfortable teaching things this way so I will stick to discussing what I would be in most of the time which is (by walking my SS down ) a 3-5 front. But what I got from him was I loved how he called his blitzes. It was ridiculously simple, so simple that I questioned how in the heck I hadn’t already thought of it. His DL movement and style was the same as mine, a lot of slanting. He paired his 3-3 stack and each DL was married to a stack LB, meaning M and NT always had both A gaps, DE and OLB always had B and C gaps, this was exactly how I had my defense set up. So when he wanted to blitz, say he wanted the Left SS and MLB to blitz, he would call 13 attack. This told the #1 and #3 LBs to blitz. #3 would be the MLB, he knows he is blitzing, and he knows he and the NT have both A gaps. So if he knows the NT is slanting to to let’s say the right A Gap, he blitzes the left A Gap. Since Each LB is married to another player and can only blitz, at most 2 different gaps, once his # attack is called he just has to make sure he goes opposite of which way his DL is slanting. This definitely beats my way, my playbook used the old school things I had learned, named blitzes for each Lb and Gap, now I just feel that way is old, dead, and inefficient. He used, just as I would, a wristband for his MLB, so he simply had to yell out which number to call, MLB would use the wristcoach and tell the defense the play. I think this way is simple because you never get caught up making the wrong front/slant/blitz/coverage call and putting yourself in a bind. I know a lot of guys still signal things in, but if you make a mistake in the heat of the moment you can kill yourself. Making the wristband early in the week allows you to double triple quadruple check it out to make sure you have everything covered, and you can use it all week in practice to as another test, making sure everything you have called on a given play fits together properly. This system of calling blitzers is easy, I can’t think of any thing simpler. This can easily be translated when moving from 3-5 to a 3-4. We drop one designated SS back giving us a 2 high shell. Now we are in a true 3-4 front, the LBs will now unstack, and even up into a traditional 3-4 look, but they will retain their #s, so that there is no new learning. So say our #1 LB is our better coverage SS, he is our adjuster, moving between 3-4 and 3-5 defense. He is always our number 1, and will always align on the defense’s left side when we walk him up into the 3-5. Continuing from left to right each of the reaming backers are numbers 2-3-4-5. So when we drop #1 back into a 2 high look , the other 4 LBs retain their LB blitz #. Now even when we go 2 high, none of the front rules and blitzes have to change. This gives us a multitude of looks we can possibly give an offense. There is no perfect defense, their are justifications for every defense. I believe this defense possesses a sound way of defending every gap, which has been and always will be the name of the game in high school defense. 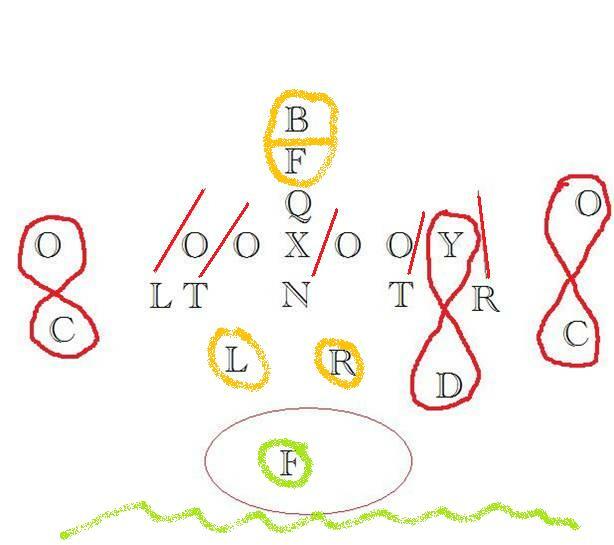 I am not trying to sell everyone on running any specific defense, I really just wanted to share this simple, efficient system for conveying blitzes to your defense. 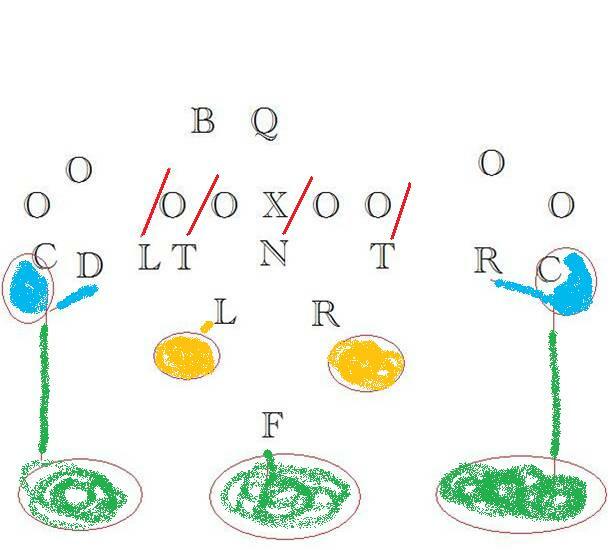 This system can be used in any defensive system, it is a matter of assigning possible gaps to defenders, and numbering your potential blitzers. This can easily be done out of a 4 man front look, numbering your 3 or 4 LBs, and have them understanding what gap they are responsible for depending on DL alignment. Hope this makes sense and wasn’t all incoherent rambling, I am typing this while currently in a bit of a food coma. Please ask questions, leave comments for feedback, comment on anything you would like to see me post on, I really want to make this a better blog, and I need YOUR guys’ help! In regards to an article by Steve Axman on how Coverage and front’s must relate to each other to be sound. I am going to simply talk about coverages with a 4 man rush, for simplicity sake, I will leave zone blitzes out of this post. In the article by Axman he discusses everything out of a 3-4/5-2 defense… I feel pretty comfortable explaining this further because I have even though I have worked with multiple D Coordinators int he 5 years I have been coaching, they have all been 3-4/5-2 coaches. 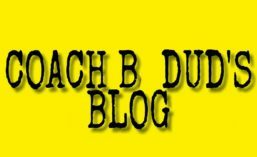 This whole post will be based on a 3-4 defense but the principles behind it apply, or at least should apply to any scheme. I want to first make a statement, because ABC wanted to know if this concept is easier to understand when dealing with a 4 man front. It is easier to grasp in a 4 man front simply because those 4 are rushing every play without change…The DBs and LBs will have different responsibilities depending on coverage but those 4 down linemen will be rushing every snap. In a 3 man front (whether 3-4 or 3-5) the down 3 are rushing and 1 more player will be coming on most snaps giving a 4 man rush. So after the snap it will either look the same or very similar to a 4 man front but the 4th rusher can change depending on coverage. When creating a defensive scheme, one must first start with the coverage they want to run. This coverage will then determine what front they can get into and which players are available to rush the quarterback. It is important to see how the coverage you play correlates with the secondary’s run fits within your scheme. Players need to understand what it means to be a force player, or an alley player, and where they need to be on certain run plays. I will explain things first against a basic pro style formation, just for simplicity sake. They of course split the field into 1/3s, do not get beat deep! Typical alignment is for corners to be 7+ yards deep at the snap and staying in their deep 1/3. On a run play they are secondary run support, they should keep all run plays inside of them and just make a sure tackle. In cover 3, when they are making tackles it is preventing the big plays. Free Safety should align to the middle of the formation, keying the strong side #2 for his run/pass read. He has deep middle on pass. on a run he is the alley player. In Cover 3 the Strong Safety is in a rolled up position, to the strong side. He has the flats or curl/flats, on pass. He is the force player on outside runs. He is to force all outside plays back inside of him. Now that we have seen what the DBs are doing, I will illustrate how this coverage dictates the front that we should run. Some clarifications of my drawing, I used this in a PPT playbook I made up for my self when I took a DC job a year ago. I will differentiate by writing LILB or LOLB etc. Now let’s discuss the above diagram. 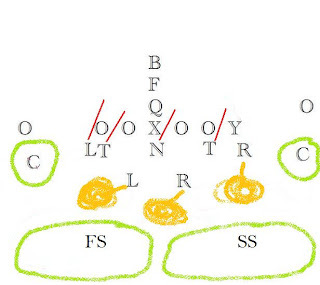 The 4 DBs have given us coverage in the 3 deep zones, and the curl/flat zone to the strong side, but now we need curl/flat zone to the weak side. This becomes the responsibility of the LOLB. His job is just like the SS, curl/flat zone and force player on run plays. Because he will be vacating, we need a edge rusher/contain man to that weakside. So the natural/simplest answer is to slant the Down 3 DL to the weakside. By Slanting weak (as shown) we get a contain rusher on the weakside and account 1 player per gap. Defense is all about gap integrity and support. The 2 ILBs have the hook zones on pass coverage. Now we are in a spread look. I would call this strong Left because the Back is also to the Left. This puts our SS (D) to the left side. Everyone elses job remains the same. We slant to the weak side (right) to get an edge rusher/contain man to the weakside. The only actual difference is now that there is twins to the RT side, our ROLB must remove himself from the box, at least splitting the difference in order to cover up the #2 WR and effectively cover his curl/flat zone. My base rule in this defense is for the Weak OLB (ROLB in this case) to split the difference when he has 2 WRs to his side. Just a very small change, every one’s job remains the same. 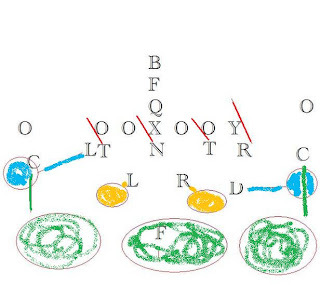 The coverage (3) dictates which way to slant our DL, and which of the 2 OLBs will be rushing. We will start with the Safeties, positioned on each hash. They have Deep half and are the alley player on runs. The Corners are up jamming #1 WR, funneling him inside to the Safeties. They have Flats on Pass, and now they are the Force players on outside runs. They must force all run plays back inside. 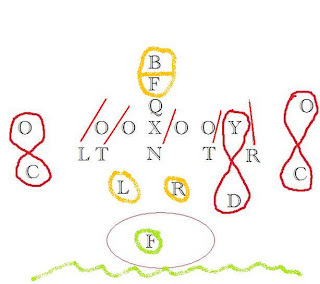 In Cover 2, the 4 DBs take the 2 Deep Zones, and the 2 Flat Zones. We are left with the 2 Hook/Curl Zones, and the middle zone. 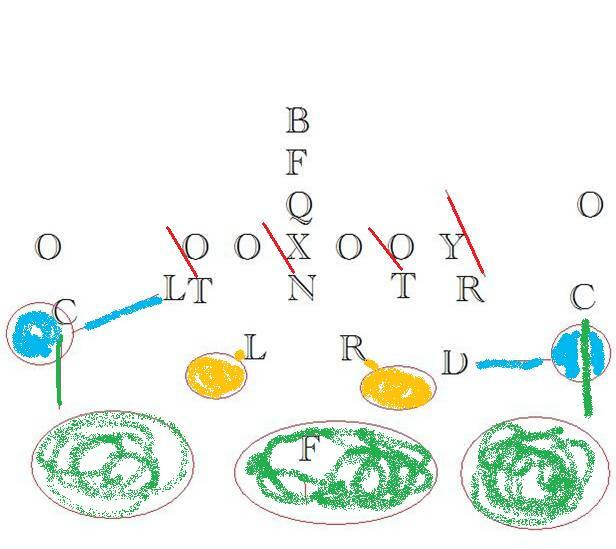 We will drop the Strong side OLB (ROLB) into the hook/curl zone on pass. The SILB(RILB) drops into the middle zone. The WILB(LILB) drops into the weak side hook/curl zone. Now we have all 5 underneath zones covered, and both deep zones covered. Since all pass zones are accounted for, we are able to bring the WOLB (LOLB) off the edge, giving us our 4th rusher. Again, the coverage dictated our front and run support. Playing Cover 2, forces us to slant Strong. Now to explore Man Free Coverage. Now I must add that playing man Coverage does allow you to bring a 5th rusher, however you lose a lot of your run support because now your DBs are locked man to man, so they can not have their eyes in the backfield providing your run support. FS plays Center field, he is the only DB who can have his eyes on the play and he is still able to run the alley. His job in Cover 1, is to save touchdowns. the SS has the TE man to man. His alignment can be played with depending on his skills and the TE he is up against. Some guys want to be in his face pressing, others do better playing off. Both ILBs are responsible for the RBs out of the backfield. that is it for pass responsibility, and we are still left with both OLBs, so they become our rushers. Now that we have 5 rusher we can do multiple things up front. We can slant strong and bring 2 off the strong side edge. We can pinch our DTs and bring OLBs off the edge, really just about any thing will be ok here as far as a twist or stunt, as long as we have someone assigned to every gap. In the diagram I have the DL slanting Strong so we can have a defender in every single gap and bring 2 off the strong side if the TE releases. Again the draw back of playing Man is that you lose out on those DBs with vision on the play, and therefore lose your secondary run support. You risk getting beat deep. That said in the past we have often have better athletes than our opponents so we have played a lot of man to man, figuring we will get to the Qb by bringing the extra man, before we will get beat in coverage. This has worked well for us a good deal of the time, but we have been burned in it occasionally. I hope this has helped to clarify the idea of how your coverage will determine what you are doing with your front and how they tie into one another.